That's lovely - he's certainly got his hands full. Are they the same children at different stages ? well I like this one best and i love the flower edged bit. Again, great multi-photo layout. The top & middle are our 2 youngest nieces. bottom one is one of the youngest and her sister and Sarah with the glasses. 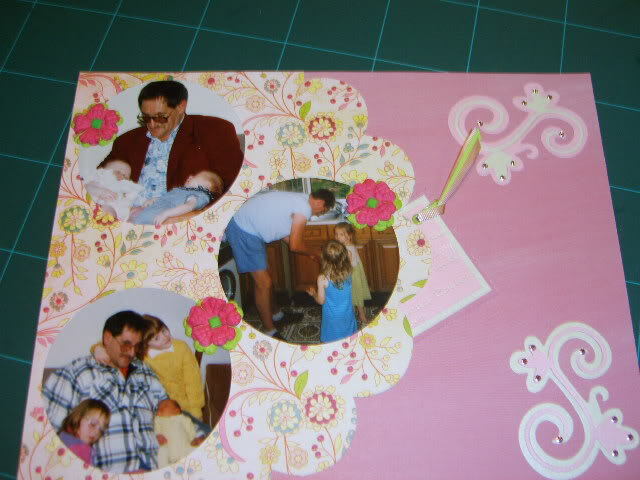 Pretty backing paper and those scrolls are lovely. That hlaf flower is a lovely way to back them, and the scrolls with bling are very pretty. Oh I do so love those swirls Cath! Really nice, Cath. I like the scalloped circle very much. I love this. The scallop, the circles the swirls. very very pretty cath. Are the swirls a chipboard set, or are they a die. The swirls are Sizzix Sizzlets nesting swirls set no 2 which I treated myself to at the craft show last month.